Ant and Dec both met each other whilst working on the BBC's children's TV drama Byker Grove. Still at the age of 13 they became the best of friends, although at first they didn't really think much of each other! When asked in interviews, Dec always tells the story as when he first saw Ant "He was sitting in the corner with his head in his hands and I thought 'What a miserable bugger!'" Declan had been at Byker Grove from the start, Ant was a newcomer at the beginning of the 2nd series. 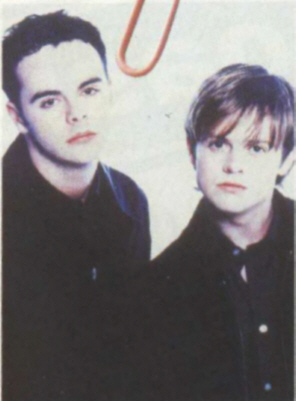 But by 1993 the storyline given to PJ and Duncan (Ant and Dec) on the show lead them to their pop career! The song "Tonight I'm Free" started it all off. Ant and Dec fans asked if they could release the single, and so they did due to the demand. Little did the lads know that this was to be the beginning of pop stardom!!! I won't give you the full discography, but 14 fantastic singles, 3 brilliant albums and three eventful years later, Ant and Dec have put their music careers on 'the back burner'. The series most originally titled The Ant and Dec Show was born, two series were produced and shown on BBC, both were very popular and successful. However, in 1997 a move to Channel 4 meant a later time slot and a differently titled show...Ant and Dec Unzipped. Again, very successful and packed full of classic Ant and Dec humour. Anyway...the ending of their musical career after their 1997 tour was by no means the end of Ant and Dec! A year out of the showbiz limelight was not much of a rest for Ant and Dec! Ant and Dec have done four successful tours in total. They did the Psyche Tour in 1995, The Christmas Cracker Tour 1995, the Out On The Tiles Tour 1996 and the Cult Tour 1997. They were working on their latest and most successful project to date...their own Saturday Morning television show! And a show to replace The Chart Show. Ant and Dec this time decided on a move to Channel 3. And so...SM:tv and CD:uk were born. The highly originally titled SM:tv (Saturday morning TV) is aimed for the younger audience starting at 9.25 am every Saturday. The show is filled with cartoons, the chance to win prizes and Ant and Dec making fools of themselves in ridiculous, but highly amusing sketches. Once SM:tv's over at 11.30 am Ant and Dec still can't take to their beds. The studio is filled by a hyper-active audience and on average, 7 live music bands perform throughout the course of the hour show. Competitions, prizes and the chart run down has made CD:uk Britain's most popular music show. The BBC's rival Live and Kicking recently losing the ratings war between SM:tv and CD:uk has proved that fact. SM:tv and CD:uk have been granted a 52 week run and it began on August 29th 1998, however it's more than likely that Channel 3 will extend this contract due to the huge success of the show. As if this wasn't enough for Ant and Dec to be busying themselves with. But last Christmas they starred in their very first Pantomine, Snow White and the Seven Dwarfs . This also was a great success for Ant and Dec and they're in huge demand for next year's Panto line up, although Ant and Dec are unsure whether to commit to anything due to the closeness to the millennium. They want to be at home with their Mams!!! Ahhh!!! Hahaha! With all these achievements under their belts, it makes you wonder what more Ant and Dec are capable of suprising us with next. Needless to say, they are nowhere near the end of their successful careers, and I'd say the excitment's just beginning!!! A HUGE thank you to Ange for writing up this biography for my webpage!!! You are a legend!! Cheers hon!! :) It rocks! !